Your search will return a set of ads in descending price order. This is a convenient way to narrow your search before you start visiting properties. To actually see the properties and make bids, you need to work with a real estate agent. If you are a property virgin, you may not be familiar with MLS. Basically, it’s a database of properties for sale, with facts, statistics and pictures that you can view. MLS allow different brokers to work with one another by sharing commissions. By listing your house for sale on a MLS, you give many brokers an opportunity to show your home to their clients, thereby maximizing your property’s visibility to potential buyers. Of course, the more interested buyers, the higher the final sales price – well, usually. The point of using an MLS is to buy or sell a property. 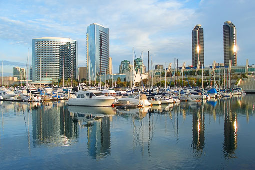 If you are new to San Diego, let us say you’ve picked a wonderful place to live. San Diego County has dozens of residential communities that attract people of every interest and budget. We are the eighth largest U.S. city, and in our eyes, the prettiest. Unquestionably, the biggest single attraction is the seacoast – beaches, surfing and sun make San Diego popular with the young and old alike. Our population is rapidly approaching 1.5 million, no doubt in part due to the mild year-round climate and the burgeoning growth of the biotech and healthcare industries. We have many Navy personnel based here in San Diego and you won’t find a more patriotic city. The mortgage crisis of 2007 took its toll on San Diego home prices, but they have since leveled off and are showing signs of recovery. With interest rates low and the greater opportunity to enter into a short sale, excess inventory is quickly disappearing and certain communities are beginning to see price appreciation. If you are thinking about buying a home in San Diego, we’d like to suggest that right now is an excellent time.